One of the most challenging aspects when it comes to summer entertaining is how to keep your guests cool. 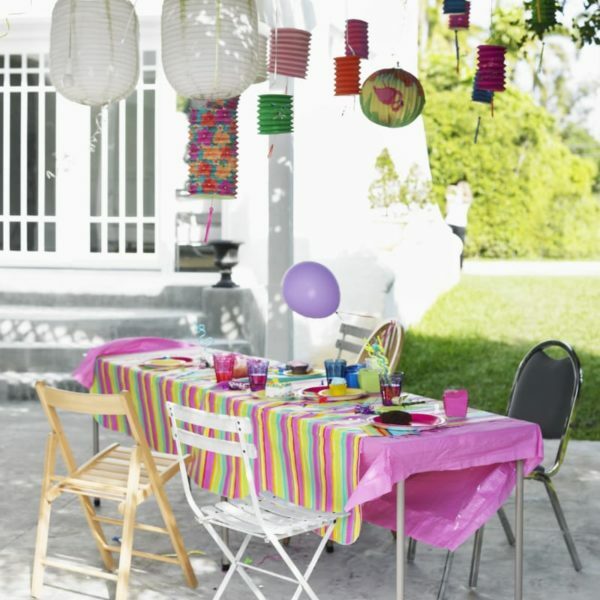 An outdoor party in the backyard can be made or broken depending on the temperature. If people start overheating, they become uncomfortable and irritable, and you don’t want your event to be remembered for anything like that. That’s why it’s important to consider how you can protect your guests from the searing heat that affects many parties held at the height of the summer. Thankfully, there are plenty of relatively simple steps that you can take to help ensure that your party remains as cool temperature wise as it is event wise. The most obvious way of avoiding the heat of the day is to start the party later than you normally would and have it run long into the night. In the middle of summer, the temperature soars to the point where you could stay outdoors until the sun rose the next morning if you really wanted to. There are two main concerns about running an event so late. The first is that once the sun goes down, it can seem like a difficult task to maintain enough light in the garden to keep the party going. You can avoid this though with some clever backyard lighting ideas which can range from something as simple as hanging up some fairy lights or lanterns to installing LED’s in your garden fixtures. Candles are also a good way of adding a natural glow and ambiance. The second is that if you are planning a family-friendly event, children can’t realistically be up into the early hours. The solution here is to start the party at around 5pm. That way, you miss the sun when it is at its hottest at around 3pm and also give those with children a good period of time in which to enjoy the festivities. The sun is powerful enough to warm up your guests on its own, so you don’t want to be exposing them to additional artificial heat as well. That means setting up your cooking areas away from the patio, where you’ll presumably have your seating areas for guests to gather. Whether you are using a BBQ, an outdoor kitchen or going full-on caveman and cooking with a fire pit, ensuring that your visitors aren’t feeling the heat that your cooking devices are giving off gives you a much better chance of keeping them cool and comfortable. It also has the added bonus of allowing you to cook free from distractions of guests asking if there is anything they can go to help. Most summer parties are focused around two elements – grilling meat and drinking alcohol. Unfortunately, alcohol is one of the major causes of dehydration which means that every time your guests pour themselves another glass of wine or open another bottle of beer, they’re making themselves more dehydrated. You can try and prevent this from happening by laying on plenty of water for them to consume along with their alcohol of choice. Leave bottles of water alongside beers in the icebox, and you can even provide tempting jugs of water with sliced lemon, orange or cucumber which will look as refreshing as it tastes. That water will help them stay hydrated and reduce the risk of them overheating and ending up being unwell through dehydration. Keeping people out of the sun will obviously stop them getting too hot. You can do this by using any natural shade that your backyard provides. If you’ve got a border made up of trees, a fence that you know can provide shade for half the day or a patio area covered by the shadow of the main property, then create seating areas in these places to try and provide guests with shade that can help them stay cool. They don’t have to spend the entire party in these areas, but they’ll probably be grateful to spot a shady area at some point during proceedings in which they can cool down. If your backyard is lacking on the natural shade front, then you can create additional shade yourself to protect guests from the heat of the sun. If you’ve got a patio, then consider investing in some Treasure Garden Patio Umbrellas which can be used to provide cover for those guests gathered in that area. Your patio might already have cover provided by an awning. For larger parties, a tent or gazebo can provide temporary shelter from the sun, and you can even install additional cooling devices like fans inside of such structures. Yes, fans don’t need to be restricted to gazebos or tents. Outdoor fans are becoming increasingly popular as they become more affordable to the average homeowner. They work by moving air around the garden which allows your guests to stay cool and because they are portable, they can pitch up in whatever area of the backyard requires them. Another option when it comes to fans is an umbrella fan. These tend to be smaller, battery-operated devices which fit around an umbrella pole and can be used to keep the air moving and the temperature cooler for all those guests who have sought shade underneath an umbrella or parasol. Many people probably think that misters are out of their price range, but actually, you can pick these sprinkler-style devices up for less than $20 online. Misters are essentially sprinklers which you attach to any garden hose or faucet, and they will release mist into the air which can reduce temperatures by up to 20 degrees. This can be a simple way to freshen up your outdoor space. That makes them one of the most effective ways of cooling guests, but they come with a caution in that they require water to run. April 17, 2019 admin Comments Off on What causes sleeplessness and how can you fight it?